On the Club News front, it is subscription time again and a renewal form is here. No changes in UK rates but exchange rates have some benefit for those paying in other currencies although postal increases will offset this. Once again, can I put in a plea for early payment by Cheque to Phil Munson or by PAYPAL to myself. Tracking late payers and sending reminders is by far the most onerous task in keeping the Club going and detracts from possible more worthy enterprises like the Imperial catalogue. Progress has again been slow on this – take up of the un-illustrated version was minimal. I guess it may be a case of analysis paralysis in trying to decide the best means of presentation – to use another cliché, the best is the enemy of the good, so maybe its best to get something out and sort out any problems of whether the chosen digital format suits all takers. Meanwhile researchers on Heathrow History and Hangar Construction have contacted me through Air Britain and found images from the Heathrow catalogue useful. 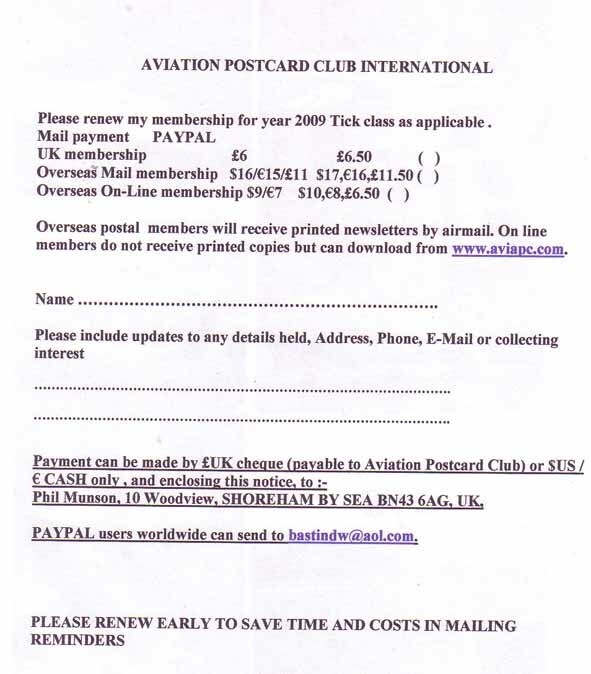 Another outside link has been to the Polish Aviation Enthusiasts Soc – member Robert Stachyra asked for a piece on the Club for their magazine, which he edits – he will provide the translation.